If the Master Luthier, Antonio Stradivari could come back and you could meet him. And if he could either speak English or have a translator interpret for him, what would you say to him? Would you ask him some questions? If so, what would you ask him? Would you thank him? Shake his hand? Tell him your violin/viola/cello/base story? Would you play your instrument for him? Would you ask him to play your instrument? I am curious what your responses are. Please feel free to respond. @pchoppin and others, I would spread some ground tea leaves on tuned violin plates and demonstrate the visual mode patterns (see photograph). I am sure he achieved similar results through the more laborious procedure of plate tapping. Stradivari constantly tinkered with his designs and measurements throughout his life and not all of his creations were gems. I think that he (and the composer Bach) would be fascinated with modern technological advancements. I also seriously doubt that he would stubbornly cling to “the old ways” such as the use of hide glue. I suspect Stradivari himself might want to discuss wood sourcing with Nagyvary, and would be fascinated with Fast Fourier Transform analysis. Re: hide glue, I was under the impression that the reason for its use is to allow violins to be easily re-opened. Presumably modern adhesives with similar properties exist? Hi @AndrewH and others. Hide glue was the best adhesive available at the time. I have read that it’s best property is that less force is necessary to break a glue bond than is needed to break the wood. A glue bond is easier to repair than a wood repair. A modern adhesive such as the original Titebond shares the property of easy removal at the seams, but makes a stronger joint. It is often the case where new wood breaks before the glue joint is separated. 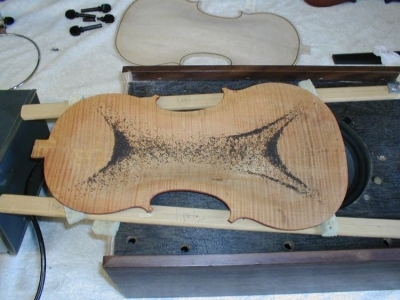 One modern luthier advocates the use of Titebond on violin seams by making a wood/newspaper/newspaper/wood composite, which appears to be an ideal solution. I would ask him to make me a violin and I would pay him the 1700's price.